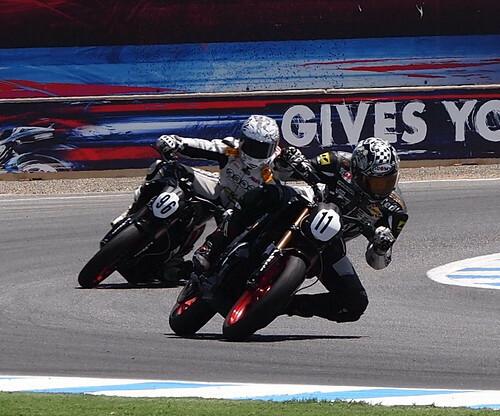 In the rush to announce the overall winners from last weekends e-Power/TTXGP race at Laguna Seca, I forgot to mention the two awards. The TTXGP offers an overall ranking of 1st through 10th (or whatever) place finishers, and in addition has two special awards for specific subsets of the racing grid. These are the TTX75 award (for bikes under 7.5 kilowatt-hours battery pack) and the eSuperStock award (for production bikes with sales volume over 25 units). Both of these are experimental classifications that may eventually become proper race classes. In the TTX75 award group, Virginia Tech was the winner. Ely Schless of Protomoto was on track to be the winner of this award, but his battery pooped out on the last lap and he did not finish the race. See Virginia Tech Bolt upgrading for next season! 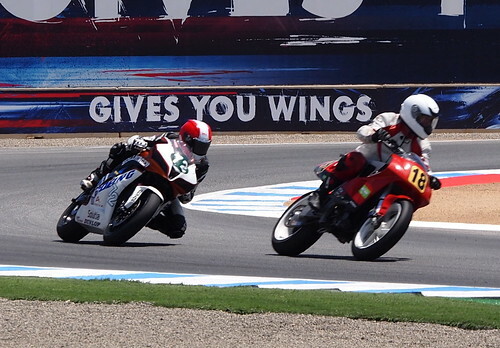 The racers in the eSuperStock award group have been characterized by very close racing. In the three events so far, these bikes have been running very close together and we have seen good racing action between these riders. The bikes in this group are all Zero S's primarily because they defined eSuperStock so that only the Zero S (and DS) can qualify. The S's aren't the best bike to base a racing series on, because the top speed is 88 miles per hour, but because the bikes are identical the results in this group depend more rider skill than anything else. In the rest of electric motorcycle racing it is the design of each specific bike which does more to determine the overall winner. David, it was great seeing you at the races again. Thanks for all the blog updates about our sport and series.